The introduction of the new Taskbar in Windows 7 changed how (many) Windows users loaded applications on their devices. The ability to pin programs (and other things) directly to the taskbar allowed them to bypass the Start Menu entirely when they wanted to launch these programs. While Windows offered an option to do so pre-Windows 7, by placing shortcuts on the desktop, it was the Start Menu that was used by many for that. 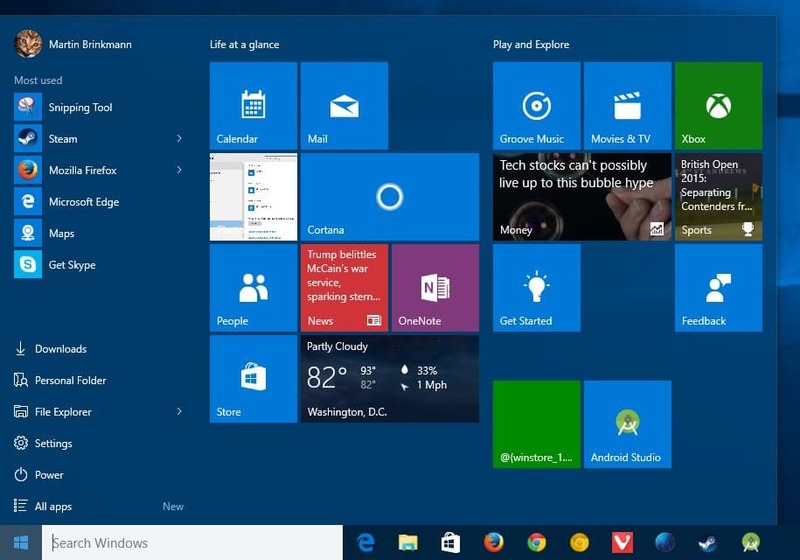 The Start Menu is still useful, even in Windows 10 as it offers access to all installed programs and other features. Some users prefer to install Start Menu replacements, a group of programs that came to prominence shortly after the release of Windows 8. Programs like Classic Shell (no longer in development), Classic Start, or Start10 all re-introduced classic reinterpretations of the Start Menu. Starting a single application from Start is probably what most users do most of the time when they use the Start Menu. But what if you want to start multiple programs or tools from the Start Menu? Turns out, there is an option to do just that. All you need to do is hold down the Windows-key on the keyboard when you select programs from the Start Menu. The Start Menu won't close automatically while you are keeping the Windows-key pressed. Note: Holding down the Windows-key does not work on Windows 7 to keep the Start Menu open while you select applications or tools to start. I did not test this on a Windows 8.1 machine. Find out how to open multiple Windows 10 Start Menu apps or programs without the Start Menu closing automatically on your first selection. Duh, cause it was too tough for m$ engineers to implement middle mouse click. I tried this first, actually: Middle-click, Ctrl-Click, Shift-Click, Alt-Click, none worked. Sorry, just kidding. But it seems to me that Windows 10 is aimed more towards the generation who does not know what the use of the mouse’s middle button is throughout the OS. FYI Classic Shell supports Shift+left click/Shift+Enter to launch multiple apps, documents, recent items etc. LOL, thanks Jeff, that is exactly what I needed, but never just knew that before!!! That would definitely save a few seconds of my life. Thanks a lot, Martin! Another really great tip Martin! It really going to look like your going for a total of 25.000 (365 (days) x 3 (articles a day) x 24 (From 2005 – unto 2029) (Only 10 more years too go! :-) ) great tip’s, easy! Interesting. What I noticed in Windows 7 is that any program launched with the WinKey pressed is launched in background – not minimised, but its windows is not brought to front. Can be either a shortcut in a folder or from the Start Menu. On the forum in this post http://www.classicshell.net/forum/viewtopic.php?f=4&t=8147 the author of Classic Shell acknowledges the github repository https://github.com/coddec/Classic-Shell which is made by the same person who decided to rebrand it as Open-Shell.